This guide will address the trends, values, and impacts of communications technologies on the business of government service at the local, state, and federal levels. Although all levels of government share similarities in dealing with services provided to citizens, each level faces unique challenges based on size, scope, budget, and population. For example, the challenge of local government in a rural area is quite different than that of a large federal agency. Government budgets are experiencing some of the tightest constraints in history. Although budgets are shrinking and the focus on fiscal responsibility is at the top of mind for all government officials, the demand for citizen services is at an all time high. In the past, citizen services were provided by increasing the size of a serving agency. Staff numbers were increased to support rising demand. The dilemma is that human resources—the staff—are often the single largest operating expense any organization will bear. The solutions of the past, while they may be tried and true, have been rendered useless without the funding levels required. Government agencies require other mechanisms to do more with less. Technology has been a boon to man in many ways. In the industrial age, it allowed for increased manufacturing through assembly lines that integrated people with machinery to automate processes. Those technologies work in the industrial economy, but mankind has marched forward into the information age. Government services aren't based on durable goods or manufactured items. They're primarily based on the delivery of information and information‐based transactions. The only way to more effectively deliver these services is with tighter integration of information technologies. To enhance the management and promotion of electronic Government services and processes by establishing a Federal Chief Information Officer within the Office of Management and Budget, and by establishing a broad framework of measures that require using Internet­based information technology to enhance citizen access to Government information and services, and for other purposes. In order to do more with less, we'll draw on a lesson best demonstrated by the retail industry—self‐service. With the growth of what's most often called the "big box" store, we've seen another trend unfold over the past several years. At many of these stores, consumers head to the self‐service checkout line. For many, it's faster and easier. We scan our own items and bag our own purchases. The retailer has provided a checkout lane and the tools we need to handle our own transactions, in most cases without the assistance of a store employee. The retail industry has learned—and proven—that self‐service allows for smaller staff. It reduces expenses, passing the savings along to the customer. It gives them the power to do more with less. It's more profitable and more efficient. Government can look to the retail industry as an example. Self‐service applications are augmentation tools deployed to meet the needs of a call center or contact center. Bringing together applications and systems from multiple vendors and delivering results across multiple media, modes, and networks, the self‐service approach leverages open standards‐based platforms to help automate customer care. Web‐based self‐service is a customer relationship management (CRM) tool that is growing in importance. In government services, it allows citizens, as the customer, to access information over the Internet without requiring any interaction with a government representative. It "outsources" the labor workload of performing routine tasks from government staff to the citizens receiving these services in a friendly and cost‐effective way. In enterprise business, this approach to Web‐enabled service delivery is often referred to as customer self‐service (CSS). Self‐service delivers 24 hour‐a‐day support. It grants immediate access to information without any delays waiting for email or a return telephone call. Ultimately, the success of Web self‐service depends upon the quality and quantity of information available and the ease with which it can be accessed. There are numerous benefits to implementing self‐service applications. The most compelling motivation is the reduction of operating expense when compared with traditional services handled by a human agent. According to Forrester Research, an average self‐service session costs about $1 to process. When we engage staff resources, costs rise to $10 for an email response and $33 for a telephone call. The value of the cost savings in government can result in millions of dollars in savings. In government services delivery to citizens, communications technologies form the core service delivery mechanism. Whether service is delivered via the Web, through email, by phone, or through a sophisticated interactive voice response (IVR) system, unified communications technology is at the core. Technology helps agencies deliver services more cost effectively and without increasing staff size. As government organizations undergo extreme financial hardships, even reducing staff, unified communications helps meet the rising demand for services. This chapter will address some of the new and emerging self‐service applications being deployed at different levels of government. These examples highlight why the migration toward self‐service applications is on the rise. In this do‐more‐with‐less climate, communications technology solutions enable new service delivery approaches that enable increased or enhanced service delivery with less expense in human workforce capital. Let's start by taking a look at the more traditional self‐service applications that governments have been building for the past few years; we'll then identify and explore new and emerging trends in self‐service. Whether it's renewing a driver's license or a back‐end process to close the loop with a citizen regarding the status of a service request, technology tools make government agencies more proactively engaged with the citizens they support and help make doing more with less a reality. One of the largest adopters of self‐service applications has been state governments. Local government agencies, especially those in smaller municipalities, have always faced very tight budget constraints and struggled with funding for technology implementation while state governments have had IT budgets and project funding. The states were also frequently early recipients of federal funding support for different broad initiatives in delivering new services. Throughout this guide, we'll look directly at a number of government agencies for examples of how technology can be used to make government more efficient and cost effective. We'll look at federal, state, and local examples. Because state government agencies have been strong adopters of self‐service applications, we'll look at Arizona as our first example. Figure 1.1: Citizen services in Arizona. As Figure 1.1 shows, Arizona delivers a large variety of services to its citizens, all of which are described via a Web portal (http://az.gov/services.html). Like any service provider, government agencies pay great attention to organization of information to increase ease of use. Many of these services are simply information delivery points. Tourism, for example, provides information about events, travel deals, museums, and the like. State agencies from health and human services to agriculture strive to make as much information as possible available online in an easy‐to‐locate Web architecture. Beyond organization by the agencies represented, Arizona has highlighted the services it delivers online (http://az.gov/services_online_licren.html) for visitors who need to do more than simply collect information. Licensing and certification is a common online service that lends itself to self‐service, as Figure 1.2 shows. We see that in Arizona every kind of license and certificate imaginable can be renewed, updated, applied for, or managed online by the citizen. The breadth of licensing and certifications issued and managed by state government is comprehensive. The economy of shifting the servicing of all these varied processes to a Web self‐service portal proves to be a huge cost savings for the state. Figure 1.2: Arizona online license renewal and certifications. Figure 1.2, from the Arizona state government Web site, shows a multitude of areas where self‐service has given these agencies the ability to do more with less by empowering citizens to serve themselves. There's another value in Web‐enabled self‐service that cannot be overlooked. When a government agency can provide self‐service applications over the Web, office hours are no longer constrained to the 9‐to‐5 business day. Citizens can get the services they need at any hour of the day or night without requiring access to government personnel. When we evaluate doing less with more through communications technologies, the economic value of shifting these services from staff personnel to self‐service has a measurable impact on the staffing budgets of many state agencies. Enabling self‐service saves money and allows serving centers to deliver more at any hour to any citizen across the entire state geography. For state governments, there is a set of licensing agencies that deliver direct citizen services. In the past, the simple task of renewing a driver's license required visiting the local office for the state Department of Motor Vehicles or Licensing, queuing up in line, and waiting. Spending several hours waiting to renew your license wasn't uncommon. These agencies learned early on to streamline the process through postal services, especially where vehicle annual tags are involved. Today, almost all US states have recognized that a Web‐based, self‐service application for licensing represents a cornerstone to doing less with more. Government is answering the call to self‐service in the taxation authorities. At the US federal level since the 2001 Presidential Management Agenda for E‐Government was released, federal, state, and local agencies have been committed to the growth of selfservice. In 1953, the US Congress named the Internal Revenue Service (IRS) as the federal tax authority that has since administered a complex, ever‐changing set of tax rules. Taxpayers have relied on bookkeepers and accountants for help. This requirement for professional tax help spawned a new industry, and tax preparation services sprung up across the US. Note: On January 25, 1955, Henry and Richard Bloch scrapped United Business, their bookkeeping firm Kansas City, Mo. They created a new company, H&R Block, specializing solely in the preparation of income tax returns. Income tax preparation was really the first of two industries to result from the evolution of taxation in the US. The second industry, automated self‐tax preparation, was made possible through the personal computer industry. Any tax rules that can be written on paper can be processed in software, and the rapid growth of the computer industry helped spawn this market. In 2003, a partnership between the IRS and about 20 software vendors, called the Free File Alliance, was formed with the objective of encouraging taxpayers to file taxes electronically. This is the root of the word e‐file used in common language today and represents a major move toward online self‐service for tax preparation and processing in the federal government. The IRS was formed at a time when the US federal government stopped preparing citizen tax returns to reduce cost and improve efficiency. It was a manual process that was costly and could not scale to support the volume. Today, the IRS estimates that roughly 93 million taxpayers are eligible to use e‐file. In 2006, they reported 77 million returns were filed electronically. The portal is a non‐exclusive route into the applications and Web services that stand behind it. Its role is to support citizen transactions. With regard to taxes, filing is a component of the architecture and must be consistent with the current technology direction—Service‐Oriented Architecture (SOA), Web services, and Web 2.0. Architectural changes in technology compel government to embrace the World Wide Web and the growing cloud computing trends as self‐service delivery computing platform. Government must seize the inevitable and support the evolution toward online self‐service. Change requires diligent government attention, for example, serving mobile and transient populations. In the current landscape of the economy, labor, and technology change, existing centralized tax administration processes are at risk. As the workforce becomes more mobile, a volatile trend today, the costs of administration and compliance spiral upward, creating a requirement for hyper‐vigilant management. In 2008, the federal Office of Management and Budget (OMB) reported that the IRS could save $40 million more a year if 80% of taxpayers e‐filed. The OMB also reported that it costs the IRS $0.32 to process an e‐filed 1040 and $2.69 to process one by mail. That's a clear cut path to delivering more while reducing operating expenses. The IRS provides extensive tools to assist citizens in serving themselves. Beyond that, as Figure 1.3 shows, support for businesses, charitable and non‐profit organizations, state and local government agencies, and others is provided online in self‐service mode. 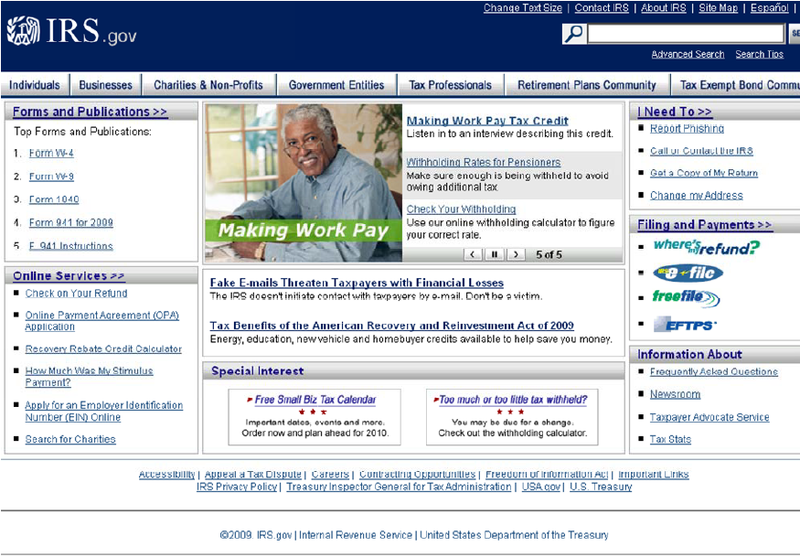 Figure 1.3: The IRS Web portal. The migration to delivering self‐service applications supporting taxation is widespread and growing. Although the IRS is the example highlighted here, there are many examples throughout state and local government. In Massachusetts, the state Department of Revenue is online (http://www.mass.gov/?pageID=dorhomepage&L=1&L0=Home&sid=Ador), delivering comparable services. In Los Angeles County, the Tax Assessor provides real estate tax support (http://assessor.lacounty.gov/extranet/default.aspx) while the County portal (http://portal.lacounty.gov/wps/portal/lac/home/) provides links to all manner of resources. Taxes are the revenue stream for government whether at the local, state, or federal level. The integration of self‐service applications through Web portal technologies delivers an effective tool for increasing efficiency and reducing operating expense that is directly tied to government revenue. Unemployment insurance is a vital issue during the current economic downturn. At the federal level, it's supported via the Department of Labor Education and Training Administration (ETA—http://workforcesecurity.doleta.gov/unemploy/). In Canada, employment insurance provides temporary financial assistance for unemployed Canadians while they look for work or upgrade their skills (http://www.servicecanada.gc.ca/eng/ei/menu/eihome.shtml). In North America, federal agencies are committed to sustainable work for citizens, and delivering both ease of use and simplified processing through self‐service applications via the Internet. The federal‐state unemployment compensation program was created by the Social Security Act (SSA) of 1935. It is part of the defense against the ripple effects of unemployment. Unemployment compensation is vital to stabilizing the economy and maintaining purchasing power. The US program is a joint partnership between federal and state government. It's based upon federal law but administered by each state. This makes unemployment compensation a unique challenge among US social insurance programs. During the current economic downturn, with unemployment reaching record high numbers, state agencies are burdened with increased demand for these services and the associated federal support. This statement from the US Department of Labor gives a hint at the labor effort in place as states deliver these vital services. In periods of national recession, when all states are impacted by high and sustained unemployment, federally­funded programs of supplemental benefits have been adopted occasionally. There were two such programs during the 1970s, one during the early 1980s, one during the 1990s, and one during the early 2000s. Currently, the Emergency Unemployment Compensation program of 2008 (EUC08) is effective from July 2008, through December 2009, and the Federal Additional Compensation (FAC) program is effective from February 2009 through January 1, 2010. When the economy declines, the demand for services rises. The burden on government rises with that demand, requiring increased efficiency and heightened productivity. For many government organizations, this increased demand is coupled with budget cuts and reductions in workforce. Unified communications technologies provide the tools to couple telephone services, Web forms, and online resources to back‐end systems that automate delivery. The convergence of voice and data services onto an integrated network platform has given government agencies the foundation to deploy self‐service applications to meet the high demand while reducing operating expense. In the United States, the Department of Health and Human Services (HHS at http://www.hhs.gov/) is the lead government agency for protecting the health of citizens and delivering essential human services. Healthcare in Canada is delivered through a publicly‐funded healthcare system, which is mostly free at the point of use with most services provided by private entities. It is guided by the provisions of the Canada Health Act. Across North America, government agencies deliver a range of services. Healthcare often encompasses child welfare. It is the largest government effort at service delivery with enormous budgets. HHS work is governed by many laws. The department provides regulations to implement the law and supports those regulations with policies and guidance for the healthcare industry, state and local governments, and others. One area of intense focus for the past 10 years has been Electronic Health Records (EHRs), which save both time and money. Secure, electronic sharing of information impacts every step in the healthcare system. Because healthcare is a personal interaction, telecommunications technologies play a vital role. The convergence of voice and data services and the incorporation of self‐service applications are crucial as agencies battle the rising demand for services. Interoperable Health Information Technology (Health IT Standards)—Interoperable health information technology has the potential to create greater efficiency in healthcare delivery. Significant progress has been made to develop standards that enable health information systems to communicate and exchange data quickly and securely to protect patient privacy. Additional standards must be developed, and all healthcare systems and products should meet these standards as they are acquired or upgraded. Information technology is crucial to delivering health care services in America, whether it's efficiently and securely transferring EHRs or answering questions from citizens seeking guidance and information. Voice services present a significant interface to the back‐end repository of health service information. An excellent example is a citizen calling an agency representative who then must access an online system to retrieve the necessary information. This synchronous service delivery consumes the human resource of time, costing serving agencies millions of dollars. Web‐based, self‐service applications coupled with the power of integrating voice and data represent cost savings that enable government to meet the rising demand while coping with budgetary restrictions. In order to meet this demand, there are two facets of system integration to consider— interoperability and standards. A great example of interoperability is our ATM card. Regardless of which bank or credit union has our account, the card operates at any ATM in a global network of ATMs from a variety of institutions. In short, as the receiver of banking services, we can communicate with any institution. The challenge in healthcare is shifting that same paradigm to not only deliver self‐service but also to bring interoperability into the architecture as a compliance requirement for legislation and regulations. The American Health Information Community was convened to advise in the development of health IT standards (http://www.hhs.gov/healthit/community/background/). It's actively supported by the Office of the National Coordinator for Health IT at HHS. Healthcare professions, technology providers, other government agencies, public and private sector employers, and patients are all actively represented. Health standards for IT will guarantee that healthcare providers have instant, secure access to EHRs, which are replacing the clipboard in medicine. In addition to improving direct patient care, all supporting services benefit from the efficiencies and cost savings. Standards are nearly finalized for patient registration, laboratory processing, prescription drug management, and secure transfer of information. It is clear that healthcare is a labor‐intensive and expensive service to deliver. Services range from broad initiatives at the federal level to local flu shot and blood drive campaigns in the community. The cost of staffing, in human capital as well as dollar costs, cannot scale to meet the rising demand effectively. In the past few years, several health "scares" have created spikes in public queries for information on inoculation. The Severe Acute Respiratory Syndrome (SARS) epidemic in 2003 drove the demand for services to an alltime high as have avian influenza and the H1N1 viruses. Self‐service applications can automate the delivery of information to citizens, resulting in enormous cost savings and quicker delivery of services. Unified communications technologies and the integration of services delivers more than improved operating costs and efficiencies. It strengthens public trust. In this era of Web 2.0 and social media and social networking, easing access to information creates the impression of a caring government that citizens view in a positive light. Not only do services become easier to deliver more cost effectively but also the recipients of those services consistently rate customer service higher in those industries surveyed. Self‐service in healthcare delivers increased service capability while managing operating expense. In addition, it raises the customer service satisfaction index of the customer citizens. We've looked at traditional self‐service requirements. Let's move our attention to emerging trends and areas where government is migrating into wider‐ranging solutions. Before reviewing some of these, we'll dig just a bit deeper into the concepts behind self‐service. Self‐service software and applications represent a subset in the field of Knowledge Management (KM). These practices codify how information is processed through rules and logic. Information is all framed within defined schema and taxonomy. This knowledgebased information is then accessible through the Web front end. Self‐service allows people to find answers and conduct transactions in an automated way rather than through traditional approaches. Self‐service solutions best address what are called "closed‐loop" scenarios. The solution developer essentially emulates a variety of expected or known queries and responses or data elements known to be related. The behind‐the‐scenes process is codifying a set of known steps and procedures, then generating a user‐facing application on the Web. Web applications have the benefit of being platform‐ and operating system (OS)‐agnostic, supporting the widest possible user base. Self‐service solutions are also, inside many government agencies, called expert systems decision support solutions. They allow government agencies to tailor support interaction in an on‐demand mode. The individual with a query can find the answers and service the need from their computer at home, a handheld device such as an iPhone or other palm device, a kiosk in an agency office waiting room, or a public space such as a shopping mall or airport, thereby reducing the need for staff interaction. An n11 telephone number is a specially assigned dialing code within the North American Numbering Plan (NANP) for the Public Switched Telephone Network (PSTN). One driving principle behind the x11 numbering is to provide numbers that are easily remembered and universally recognizable. These three digit codes were created to provide easy access to special services, the first designated number in this group having been 911 for access to emergency services. These services are defined as follows. 500,000 911 calls per day, with roughly 25% coming from mobile devices. In the early 1970s, NY Telephone, later part of Verizon, began using 211 as a short code for callers to request credit when calls were placed to a misdialed or disconnected number. This practice continued locally in that company's serving area until July 20, 2000, when the Federal Communications Commission (FCC) formally reserved 211 for community information and referral services. The 211 code was first used for human services by the United Way in Atlanta, GA in 1997. Many states followed with human services implementations. Today, this segment of telephony services is managed by Alliance of Information and Referral Systems (AIRS at http://www.airs.org/) in conjunction with ongoing involvement from the United Way of America. According to AIRS, in 2008, members answered more than 18 million calls for help. Calling 211 provides resource help for the elderly and disabled, non‐English speaking citizens, individuals in personal crisis, those who cannot read, and so forth. 211 calls provide referrals and information about health and human services organizations and agencies. As of April 2009, 2­1­1 serves over 240 million Americans (more than 80% of the entire population) covering all or part of 46 states (including 33 states with 90%+ coverage) plus Washington DC and Puerto Rico. The remaining states are all in various stages of planning and implementation. Every few weeks, these coverage numbers increase. A national cost benefit analysis conducted by the University of Texas estimates a net value to society of a national 2­1­1 system approaching $130,000,000 in the first year alone and a conservative estimate of nearly $1,100,000,000 over 10 years. Burning building? Call 9­1­1. Burning Question? Call 3­1­1. 311 was first used October 2, 1996 in Baltimore, MD. Like 911 service, callers are directed to a call center. The difference is that 311 calls are assigned a lower priority, only being answered when no 9‐1‐1 calls are in queue. 311 extends the system so that true emergency callers obtain a quick response. New York City implemented the largest 311 service operation in the US in 2003. In Canada, the Canadian Radio‐television and Telecommunications Commission (CRTC) reserved the use of 311 for non‐emergency municipal services throughout Canada on November 5, 2004, with the first active service in Calgary, Alberta six months later. In the past, 311 was used as a fictitious area code in Bell System advertisements in the US. Advertisements used Area Code 311 555‐2368. This imaginary phone number was used in When a Stranger Calls, a 1979 horror movie. Figure 1.4 shows a view from Google Maps of the current American and Canadian cities where 311 services have been deployed. Figure 1.4: Google Maps view of existing US and Canadian 311 service centers. The rising demand for services isn't just a concern for federal and state agencies. Municipalities are also feeling the pinch of how to do less with more. Unified communications technologies and industry support for open standards and interoperability couple to make self‐service applications a viable solution for local government. Local government is perhaps the most directly engaged with citizens. Unlike some federal or state government agencies employees, local government employees live and work in the community. Because they live and work "on the front lines," they are often immediately accountable to citizens. When budgets are tight and every expense is being scrutinized, justifying the implementation of a 311 system makes sense because it helps control costs, minimize risks, and improve performance in serving the community. Another example of enhanced service that a city might deliver is the integration of reverse 311 capabilities. This approach can integrate with the city's Geographic Information System (GIS). In a major event, the local government might identify an area on the map, then use the CRM software for 311 service and a telephone number database to generate a list of phone numbers in the defined area. This proactive response to the self‐service application could then use auto‐dialing functionality of the city's telecommunications system to deliver recorded messages to citizens in the affected area. Adoption is on the rise. At present, local and municipal governments are actively migrating toward the implementation of 311 services. In 1999, the US DOT envisioned using 511 to disseminate travel information to the public. There are simply too many potential sources of traveler, each with a unique telephone number. Travelers can't know what telephone number to call. 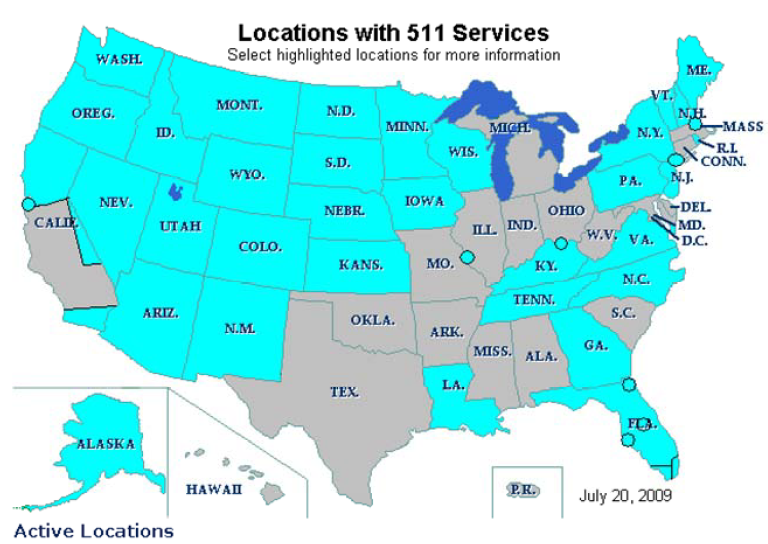 511 can provide an aggregated source of information at a state or regional level. 511 brings Intelligent Traffic Systems (ITS), road condition, public transportation, and weather information together for single‐number access by the public. Typically, 511 services have been used for traffic conditions, construction detours, and road conditions in inclement weather. These services are used heavily in metropolitan areas and provide a real value to travelers. Figure 1.5: US DOT FHWSA map showing active 511 service areas. Adding further merit to the argument in favor of managing this revenue stream is the widespread use and ongoing growth of mobile telephone services. According to the International Association for Wireless Telecommunications (CTIA), as of June 2009, 89% of the US population carries a cell phone. The "double win" of increasing efficiency and easing the collection of fees associated with revenues producing investments strengthens the business case for deploying 511 solutions sooner rather than later. Current adoption rates are rising, and the inclusion of 511‐related activity in several state strategic telecommunications plans suggest the continuation of this trend. The Internet has forever changed the expectation of customer service. Timely response is a more highly‐valued characteristic today than ever. Because of telecommunications and networking technologies, customers expect instant gratification and immediate response. This societal expectation translates to similar demands on government service delivery organizations. The best customer service culture in a government organization is still limited to the resources available. The labor resources required to achieve the best customer service can't ever compete with the speed and efficiency that comes with self‐service applications. Realtime service delivery can only be achieved with unified communications tools to streamline how these services can be delivered. In traditional service models, government agencies deal with citizens either on the phone or in person. Self‐service applications reduce but don't eliminate the need for one‐to‐one contact entirely. As described earlier, self‐service applications are designed to handle a set of expected queries. Just as a frequently asked questions (FAQ) page on a Web site can't answer all questions, the self‐service application can't serve every need. Unified communications solutions effectively integrate the Web application with the telecommunications system. Whether it's a small municipal government with a single telephone or a large federal agency with a large contact center staffed around the clock, the highest efficiency and best service requires resolving the query on the first telephone call. First call resolution rates are more likely when the back‐end support systems are fully integrated with the citizen‐facing systems. When this integration is at its finest, the self‐service application includes a "Speak to a Live Representative" button. This button can be used to either chat online or to connect a telephone call. Sophistication levels vary based on specific implementation. In a simple system, it might just establish the connection to a live person. A very complex system might transfer the user to a phone call with a live expert agent who sees an image of the user's screen and can then assist the user through to successful resolution. The bottom line is that unified communications technologies aid in the evolution toward Communications Enhanced Business Processes (CEBP). This evolution delivers efficiency in customer service that directly impacts the bottom line of the serving agency. City and county governments face challenges not dissimilar to small and medium businesses in a number of ways. Their budgets often preclude some of the most effective solutions for the large enterprise. In order to deliver care to the local community, they must look to technology to augment their services in a number of areas. Because city and county government lives and works in the same area as the population they serve, they also make up what are termed the first responders in an incident. Because this first response is frequently tied to disaster situations, these government organizations must look very closely at every opportunity to leverage technology for improved delivery at reduced cost. Extreme weather presents risks that hit three groups of people harder than others: elderly, homeless, and children. In the event of extreme heat or cold, these people are the most susceptible to personal danger from the weather. Self‐service applications might include everything from a weather advisory Web page displaying telephone numbers and emergency contact information to 311 services providing information about services available. Different geographic areas may have different localized events that cause harm and require specialized attention. In the state of Washington, there are two examples: Tsunami warnings on the Pacific coast and volcano tremor sensors for Mt. St. Helens and Mt. Rainier. Although risk assessment indicators place the likelihood of occurrence for emergencies related to these events low, the damage to life, limb, and property is quite high. State and local agencies in the potentially impacted areas are compelled to take measures to provide information and services to support the health, well being, and welfare of citizens. Hurricanes happen around the world with disastrous consequences. In the US, Hurricane Katrina in 2005 did more to raise national awareness than storms in the rest of the world had ever achieved. Localized events such as Katrina occur around the country. Wildfires rage in dry, brushy areas each year. Earthquakes hit fault‐prone areas like California. Floods occur around every major river or watershed. These events carry a higher likelihood of occurrence than the localized event already cited. In some cases, they're a known annual event that no manner of preparation and planning can eliminate. Like localized events, the onus is on local government to be among the first responders on the scene. Whether it's the small town volunteer fire department, a statecoordinated team of firefighters, or a National Guard Unit deployed to assist under order of a state governor, the government agencies providing service need to offer information as a cornerstone of those services. Self‐service applications help first responders in government at a time when public fear is high and the need for service is at its peak. In 1996, Amber Hagerman disappeared while riding her bicycle. The call to 911 reporting her disappearance was placed a mere 8 minutes later. Police believed this was what they call a stranger abduction. Roughly 750,000 children are reported as missing to the National Center for Missing and Exploited Children each year in the US. Amber's story led to the creation of Child Abduction Alerts (CAEs) that are widely called simply Amber Alerts in both the US and Canada. Amber Alerts are broadcast to citizens in a number of ways. Radio and television announcements are set via the Emergency Alert System and NOAA Weather Radio. Additionally, electronic road‐condition signs and a variety of billboards broadcast the alerts. Email notification was introduced earlier in the evolution of the alerts, and more recently, SMS text messages have proven both effective and popular in many geographic areas. 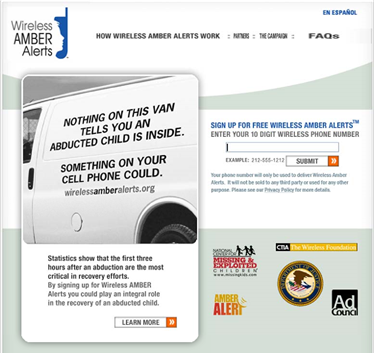 Anyone can sign up at http://www.amberalert.com/ to receive Amber Alerts as an SMS text message from the Law Enforcement Alerting Portal, a stellar example of using unified communications technologies to deliver advanced alerting services. Figure 1.6: Tennessee Amber Alert SMS signup. In Figure 1.6, we see Tennessee's sign‐up screen to enroll to receive Amber Alerts via SMS messages. The advantage is that a single message can be easily broadcast to thousands of recipients in a single blast. With the rise in Internet‐enabled mobile phones, these messages contain links to Web pages with detailed information about the event, clickable links to dial phone numbers, and other useful tools. Recently, iPhone developer and data forensics expert Jonathan Zdziarski has teamed up with Amber Alert to create an iPhone app for receiving detailed Amber Alerts via the iPhone. Zdziarski's application lists all active AMBER alerts with a small picture of each victim. Automating Amber Alerts casts a wider net, raising the likelihood that a child will be returned home safely sooner. This integration of communications technologies brings government and law enforcement agencies into closer partnership and conversation with communities. It's an example of technology making government more efficient and cost effective while humanizing official agencies during a traumatic time for everyone involved. Another area government agencies at all levels find beneficial is the implementation of a callback service coordinated within the self‐service application. Earlier, I touched on the realtime transfer of a self‐service application user to an expert agent. Callback services provide a variation of that capability that is proving to be a "customer satisfier" across both private and public sector service providers. We all hate sitting on hold on the telephone, just like we all hate "voicemail jail." When a citizen needs to speak to a live person, they don't want to sit in a queue listening to music on hold or some other information. Callback services allow the user to elect to receive a return phone call rather than sitting on hold. The elegance of callback services comes from the integration of the systems involved. The telephone system or Web‐based application can potentially communicate with one another as back‐end servers. With many VoIP‐based systems today, the two are seamlessly integrated. Thus, the Web application can identify how many calls are in the queue, and based on current calling patterns, estimate the time until the citizen will receive a return phone call. Private sector companies such as Comcast have learned that customers are far happier during a problem if they can request a callback, then receive the call from a service agent who provides personalized information or resolves the problem. Callback services used in conjunction with transfer to a live expert agent offer the best of both worlds. Organizations implementing both create an option of balancing the staff levels at peak periods to control the "wait time" the caller experiences. Sound financial management requires strict adherence to fiscal responsibility guidelines. In order to get the most value for dollars spent, the integration of technology dollars must deliver cost savings over the traditional model on increasing staff size. Human capital is expensive. With shrinking budgets, staff growth is limited. For many government agencies, staff size is diminishing. Performing on demand—On demand, realtime information and transaction services can only be provided through the convergence of voice and data, integrating onto an automated platform. Engaging citizens—Citizens actively seek engagement with the companies they do business with and their government at all levels. In Chapter 4, we'll dig deeper into the impact of Web 2.0 and mobile technologies as a tool for government to engage with its citizenry. Using networks and partnerships—Technology vendors, other government agencies, and private sector organizations share a common goal: delivering services more efficiently and cost effectively. The delivery of social, health, and government services provides a model that directly impacts citizens' quality of life. For local government in particular, these services may have a direct and immediate effect on the local economy. Self‐service applications meet the ever‐increasing needs of government organizations at every level. Unified communications tools provide the integration of voice and data services that cross the hurdle of doing more with less. The customer relationship management aspect of self‐service applications makes citizen relationships stronger as government meets the challenge of delivering more services at a lower cost in a constantly changing environment.